The stories told at Mission u teach "that God is making a way, sometimes unseen and unheralded," a liturgist declared in July. She was speaking about climate justice, one of three topics relevant to today that engaged 140 participants, including 26 youths and children, at the educational event in Oklahoma City. Also studied were the Church’s three missionary conferences — of which the Oklahoma Indian Missionary Conference (OIMC) is one — and the biblical call to live in covenant. Christians are assured the liturgist’s declaration is true for those subjects, too. And Mission u programming "entices us to join in the mighty work" of the Creator "all over the earth." Here are a few reports of climate justice work by people of faith, shared at Mission u. Despite cancerous lesions on fish in a specific river, destitute people were catching them to feed their families in a part of Washington, D.C. Moved to action upon learning about this tragedy involving 17,000 people, one woman led an effort that now includes safe fish farms and community gardens. "It was the Holy Spirit leading the way all the time," said the woman in a video interview. Villagers in Zimbabwe walk two hours to cut trees for crucial firewood. The deforestation caused a fourth-grader to wonder: Where is tomorrow’s supply? As an adult, she initiated an "environmental buddies" program of replanting. Even the children eagerly help collect seeds. A member of United Methodist Women traveled to the Standing Rock Sioux reservation in North Dakota to stand with people protesting an oil pipeline project. The confrontation has involved not only the issue of climate justice (potential water pollution) but also Native American sovereignty. Standing Rock is "emblematic of how indigenous people have been treated," the UMW member said on the video. In each jurisdiction, trained UMW guides encourage sustainable efforts through the "Be Just. Be Green" initiative. And since the two-year climate justice study launched nationally, more than 800 youths and thousands of adults have been educated, according to Glenda Gilpin, Oklahoma UMW president. OIMC members gave special leadership at Mission u. Pastor and retired missionary Meri Whitaker taught the study on missionary conferences. 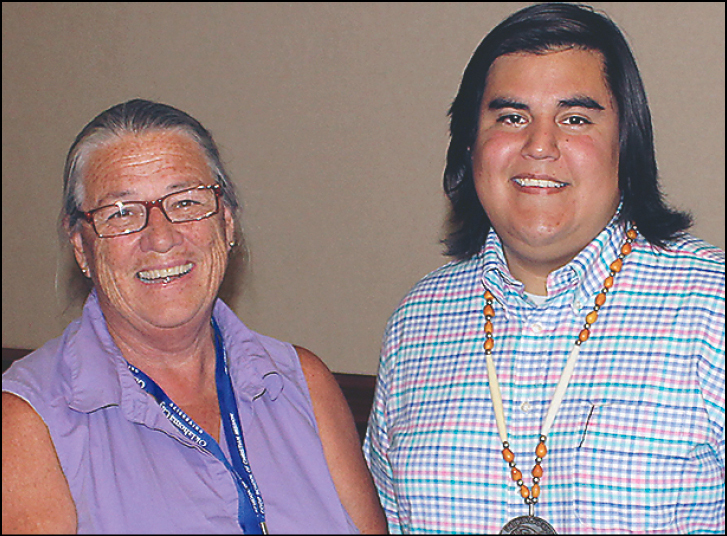 Dallas Parker, a descendant of Comanche Chief Quanah Parker, was a guest speaker. Parker twice has been to Standing Rock, delivering OIMC donations and documenting activities there. He stressed how the protest began: Sioux youths literally walked from the reservation to Washington, D.C., to deliver a petition to the U.S. Corps of Engineers. The plenary session with Parker included this reading: "In these stories we bear witness to generations who have suffered the impacts of broken covenant." The Apostle Paul’s letter to the Ephesians addressed heartache and conflict even in that ancient time. Mission u participants are urged to act upon what they learn, teaching others, working for change. Resource materials are available at www.umwMissionResources.org, 800-305-9857. The DVD Library at the Conference headquarters, Oklahoma City, also has related videos; contact Chris Schutz, 405-530-2075. Meri Whitaker and Dallas Parker of the OIMC gave leadership. C.J. 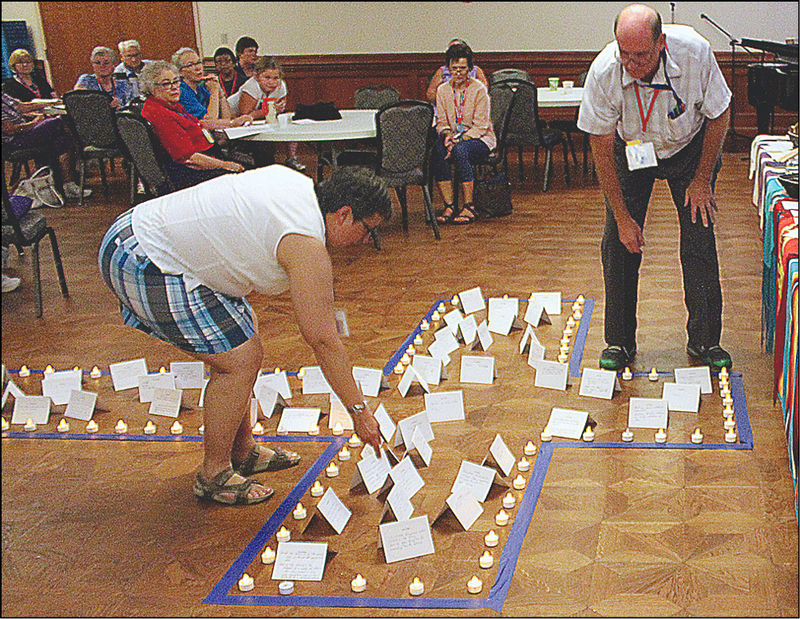 Shell and Warren Neff place their personal action cards within the outline of a cross.